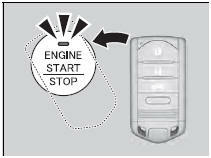 If the beeper sounds, the TO START, HOLD REMOTE NEAR START BUTTON message appears on the multi-information display, the indicator on the ENGINE START/STOP button flashes, and the engine won’t start. Start the engine as follows. 1. Touch the center of the ENGINE START/ STOP button with the A logo on the keyless access remote while the indicator on the ENGINE START/STOP button is flashing. The buttons on the keyless access remote should be facing you. 2. Depress the brake pedal (automatic transmission) or clutch pedal (manual transmission) and press the ENGINE START/STOP button within 10 seconds after the beeper sounds and the indicator stays on.